I bought quite awhile ago Honda CBR F2 1992 AC. Problem is that it came with one key and It is quite worn out. So I ordered the new one from Honda parts. But It came a bit smaller than I got one with a bike. So how long should the key be the original? 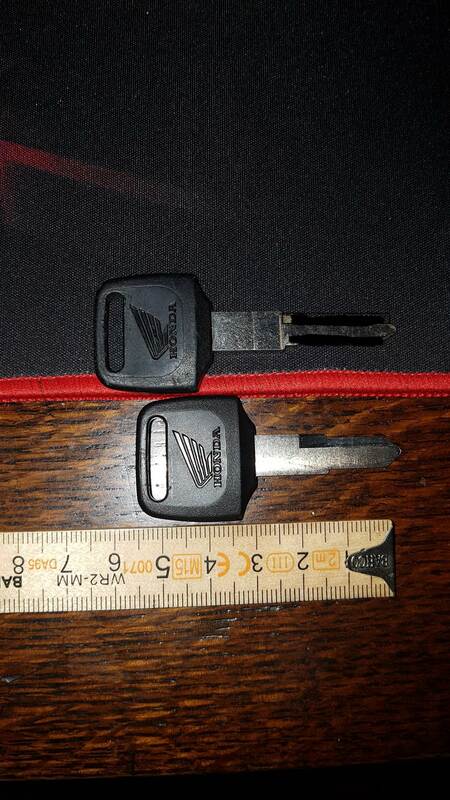 A replacement key should be exactly the same as your original. The one you have is the wrong one. It won't go deep enough into the lock to reach all the tumblers. You'll need to return that and get the right one. Be aware there are also 2 variations of the F2 key, so you'll need to know the code from the original key when ordering. If the bike still has the original gas cap, you'll find the key code stamped on the inside. I'm not sure where you're located, but I had a local hardware store cut copies of my broken key, only a few $$. With the key code, a competent key shop can make a perfect replacement. Chobes: What local hardware did you go to that made you copies? Just curious. I’m not saying local hardware can’t do it, but here in Raleigh, N.C. The local Lowe’s ,Home Depot, and ace hardware don’t carry a key that small. Sorry for the delayed response. A local Ace Hardware had a bunch of Honda blanks, must have been lucky. I've got three Honda blanks for F2/F3 if you're needing some. The Honda dealer ought to take that back and get you a new one. If nothing else works a real locksmith should be able to help you out. I went to one for a key for an XS650 and they had it in stock.